Back in January, I wrote about the My Yahoo RSS module that went into public beta testing. But what I didn't write about, for obvious reasons, was the thinking about the future of My Yahoo that was going on after that launch. This is clearly a different world than when My Yahoo was a New Thing. Personalization on the Web is Old News. Aggregation and Syndication are some of the hottest topics around these days. But the difference between old school My Yahoo aggregation and today's RSS and Atom driven aggregation is that it's a decentralized model. Well, we just launched a beta of the next generation of My Yahoo that fits into that reality. Instead of "you can add anything you want, as long as it's on the list of My Yahoo content" you can now add pretty much any public RSS or Atom feed. In other words, the content model is open. Let me say that again, just for dramatic effect: the content model is open now. This not only makes My Yahoo relevant in the modern wave of syndication, it does something else--something that Yahoo is in a unique position to do: bring RSS to the masses. There are A LOT of My Yahoo users out there. I'm sure that I can't say exactly how many, but it's a big number. Most of those folks have no idea what RSS and Atom are. They really shouldn't need to. Many of them want their favorite content all in one place, which is why they starting using My Yahoo in the first place, and they happen to want it on the web. Some folks might argue that the world just needs to learn about RSS, download and use a desktop aggregator, and so on. That's true for some people, but probably not the majority. My parents, for example, don't care about the various technologies that make their e-mail work. They just want e-mail. They don't know about HTML either. They just want to use the web. So this new version of My Yahoo tries to get us closer to the point that it Just Works. To make content discovery easier, there are multiple ways to find feeds: search, a small directory, a list of popular feeds, and even some editor's picks. You can read about this on the Yahoo Search blog in a post from Scott Gatz, one of the main forces behind the new My Yahoo. Is it perfect? No. Of course not. But it's a big improvement over the module we launched at the beginning of the year. Customization is more flexible, there are a ton of UI improvements, the searchable database of feeds is much larger. If you're already using a desktop aggregator and like all the features it provides, I don't expect you'll switch. You're an advanced user. You probably don't realize it, but you are. There's part of the population that does all of their e-mail using web-based mail services only. To others, that seems insane. The same will likely be true of web-based vs. desktop-based aggregators. I fully expect folks to compare Yahoo to Bloglines. It seems a logical comparison, since Bloglines is an on-line RSS aggregator (and a damned fine one at that). But My Yahoo isn't simply an RSS aggregator. It's still about pulling together lots of information into a single place. And not all of that information is available via RSS. So instead of thinking that My Yahoo has morphed into a low-end RSS aggregator, think of it this way: My Yahoo has adapted to handle RSS/Atom feeds in addition to all the other content that was previously available. Is this the end? Nope. There's more coming on this front. I won't say what, but I will say that we want to make this as easy as possible for new users--those unaccustomed to having hundreds of thousands of sources from which to choose. Good point. There are several "versions" of My Yahoo out there, some for other countries and some for Yahoo partnerships with broadband providers (like Rodgers, SBC, BT, and so on). Those folks will get all the goodies too, just not at the same time. What about UTF-8 support in My Yahoo? Without that it is very much difficult to use latvian/russian and other non english content.. I don't think a desktop aggregator is the answer for everyone at all. Why download another tool that does one specific job that another tool can do? With Mozilla, Firefox (with Sage) Thunderbird, and soon Safari you can read RSS and Atom just fine. I personally have never understood the desktop aggregator, but I'm just too narrow minded or naive to the benefits. The content seems to be very US centric. For example, Sports > Auto Racing doesn't have anything about the biggest events like FIA/FIM Grand-Prix or the WRC. Scott has posted a reply on the Yahoo Search blog about Firefox 1.0. It's a known problem that'll hopefully get sorted out soon. Seems to have a few quirks... I tried to add my own weblog to it via the "Add RSS by URL" (the URL was http://www.netwhatever.com/weblog/vento/index.xml). It showed me the preview correctly, with the list of recent posts, and when I click on "add" once more to confirm, it tells me it can't find the RSS file (it obviously found it, otherwise it wouldn't be able to show me the preview). The RSS file is generated by Movable Type; another blog, generated in the same installation, worked on, so I don't think it's a parsing problem (shouldn't be, at least); maybe charsets? The one that failed is in Portuguese and has lots of accented characters. The new User Interface is very easy to navigate and fast. But the only fundamental change that I noticed was removing the limitation of 50 feeds per page. Jeremy: Any chance you could pass on an error report to someone working on YahooFeedSeeker? It went nuts sometime last Thursday, and has yet to recover... so I'm a day or two away from banning it from anything I host. I can't seem to view the Beta, or any information about it, unless I have an account, which I don't have because I get bored going through the ridiculously long sign-up form to be asked everything including my shoe size (probably, I didn't check). Yahoo could learn a great deal from other sites about this. Google asks for a name, e-mail, password. Job done. Until Yahoo gets this sorted I can't be bothered with their sign-up or trust them to whore out my details to advertisers. How about more than just 3 comics? I've been using My Yahoo as my RSS aggregator for > 6 months now (it's been in beta for a while). I really like it because I can take my RSS feeds with me wherever I go, and read them from any browser. Having a desktop aggregator program has never made sense to me. They may be more powerful, but they're not at all portable. How do RSS feed producers prevent "private" feeds from getting listed in Yahoo's feed search engine? Search for "dodgeit" or "projectpath" to see an example of some feeds which are obviously publicly accessable, but NOT meant for public consumption. Any ideas? I run dodgeit.com and would like to fix this. The moment you have OPML import, you will buy out the blog market. I love the idea of using My Yahoo as a feedreader. I'm one of those people that believes web-based email systems are good, and I use Yahoo to read my weibust.net email. What's so bad about web-based email (wait, that's off-topic)? Two problems with the new features. One, why is the link to add feeds by url so small? It took me some time to find it. I would guess that would be the main way people add feeds. In my opinion it should be much easier to find. Two, I keep getting an error when trying to add my feed to yahoo. Jeremy, what about reading feeds on wireless devices? I read this page, but it's unclear if feeds will go wireless. Oh and how come no Verizon yet? Overall I like it, but I wish the top 30% of the page wasn't wasted with the title area, ad, and giant search form. At least let me get rid of the search box (or just put a small one in the left column). Same question as someone else, it seems to not take my atom feed. But as I wrote this, just thought, no, I'll try it again... and it took! It sounds like you don't consider web based e-mail as high end. I suspect that in a few years almost everybody will do all their email through a web-based mail interface. I consider myself an advanced user, and I do almost all my email with a squirrel mail with a few judiciously selected plugins (ie avelsieve). I very rarely need to read my email while I am disconnected. We made a My Yahoo "easy subscribe" bookmarklet. This is all great, but i wish the my yahoo team would start paying attention to standards for its HTML. The page doesn't even have a doctype declaration or a character encoding label! So as the layout gets more advanced, it's likely more likely to break because of the site's lack of adherence to W3C standards. Try running it through the validator: http://tinyurl.com/4mxjv -- it reports 252 issues for my "My Yahoo!". This is bad for pretty much every aspect of web design: usability, accessibility, consistent layout across browsers, separating style from content, and on and on. Ah, apparently you can move the search box to the bottom of the page using the Change Layout feature. That's an improvement. The search box has always been able to be moved. The addition of the tabbed searches is long coming though. Nice touch. I noticed that the tabbed personal pages is gone in exchange for a drop down menu to select them from. That took me a while to figure out (I don't read instructions). Not sure what to think about this just yet, but I think once you have a dozen or more custom pages with your feeds on them -- this would make sense. Think of them as channels. The new interface is just a dream to work with and very quick. A job well done Yahoo. Looking forward to seeing what else you come up with. I can't find any place to submit this question on Yahoo, so I'll ask it here...Any idea why it won't work with the Medscape RSS feeds that have Upper Case characters in their URL (http://www.medscape.com/cx/rssfeeds/Cardiology.xml) but work's fine with Medscape RSS feeds that are all lower case (http://www.medscape.com/cx/rssfeeds/news.xml)? Is My Yahoo! planning on fixing the abuse of Slashdot? Every couple of days or weeks, Slashdot blocks my My Yahoo! page from recieving it's feed for 72 hours, because the reader is polling the website too much. Not sure if this affects anyone else or not; I'm not sure how My Yahoo! works in retrieving rss feeds, whether it's per-user or just once for everyone. Seems like they need a little more discretion, though? Other than this problem, I should note, I really love the new My Yahoo! (and the old one). It's turning into a true, modern-day web portal. What is a good software (super easy to use and cheap) do you use to take a photo of a web page like what you took with that png file? I use Longfine's easy screen capture. I have used it for a couple of years and I love it. doesn't work with opera browser...how does one get rid of the beta? I'm with bubbah, I use Opera, and other browsers like Mozilla, and Crazy browser. Even the ones based on IE kernel files don't work well on "the NEW..IMPROVED...YAHOO"...so how do I dump the new interface. I tried to download My Yahoo! Beta on 3/23/07 and now I can't sign-in to My Yahoo! I can sign-in Yahoo Mail. I just want to switch it back and I don't know how. I have not been able to find information about switching back at all. Please help me so I can read the information on my pages! Hello Jeremy. I would like some information, if available, about switching back to the old My Yahoo! page. I tried on 3/23/07 to download Beta and have not been able to sign-in since. This is just happening on My Yahoo Page. 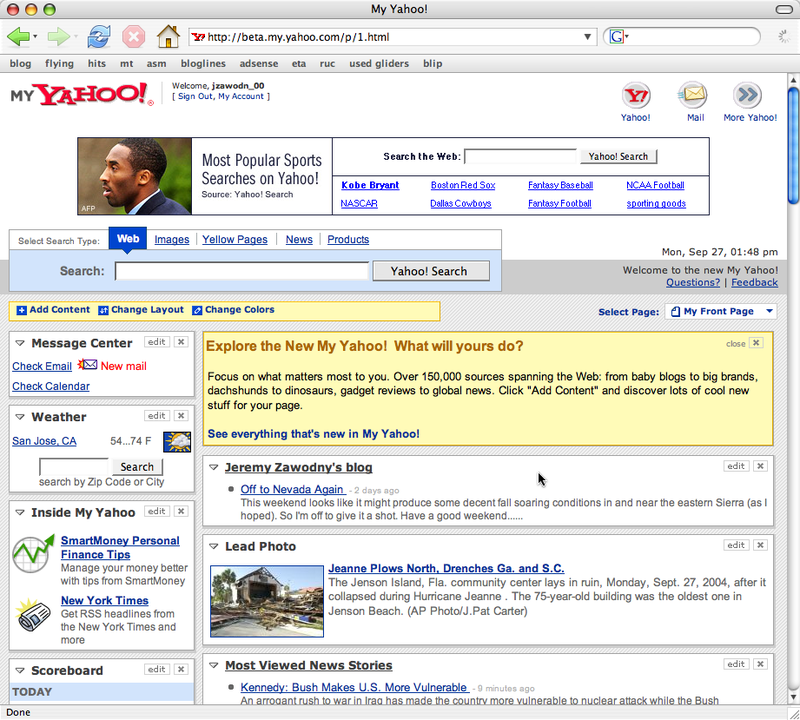 I would like to go back to the old version, but why can I sign-in everywhere else on Yahoo, but not on My Yahoo!? I also would like, NO - I prefer & expect to have the option to permanently "opt-out". This is WAY to SLOW plus all java is null=0()... cannot configure this beta AT ALL! FF 1.5 FF 2.0 iCab 3.0.3 browsers. My friends have same problems on PC windows 6 + 7. So please don't say I should get a Windows os - as phone tech has. ----> or even MSN My Spaces live???? a link you need to click to make your comment visible. about being anonymous, even if you think you are. when I want to reply or forward mail in Yahoo Beta format, I can not write on the page that it comes after pressing reply or forward page. I can not even write any context when I press new message botton. what is the problem?